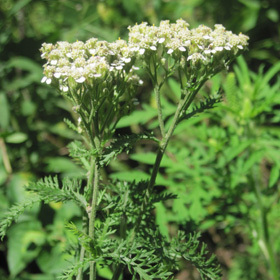 Western Yarrow (Achillea millefolium) can be commonly found in disturbed areas such as fields, pastures, roadside ditches, and prairies throughout the tallgrass prairie region. Finely divided leaves can grow up to 6 inches long and appear to be feathery. 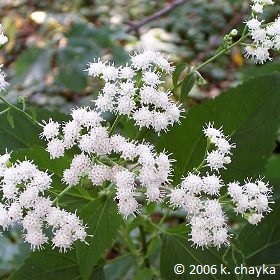 The top of each plant consists of small, white flower heads that grow in a flat, branching cluster. Plants are typically 1.5 to 2 feet tall and bloom from late spring through the summer. Sweet Flag (Acorus calamus), which grows to a mature height of 2 feet, has tall, sword-like leaves that look like a cattail. The flower stalk resembles the leaves but has a spadix (finger-like spike) that juts out at an angle and is covered with tiny yellowish-brown flowers. It can easily be recognized by its aroma, since all portions of the plant release a sweet, spicy smell when crushed. 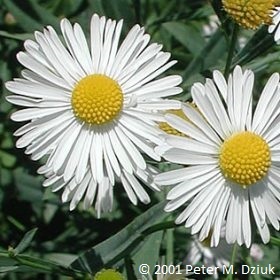 It is found along the edges of ponds and lakes, in marshes, and in wet meadows. Anise Hyssop (Agastache foeniculum) produces an array of showy purple flowers that are very attractive to bees, butterflies, and hummingbirds. It matures to a height of 3 feet and thrives in both full sun and partial shade. Once established, this biennial will reproduce easily on its own. 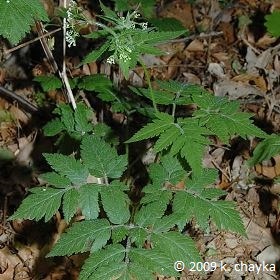 The leaves emit a licorice odor when crushed and have been used to make tea. 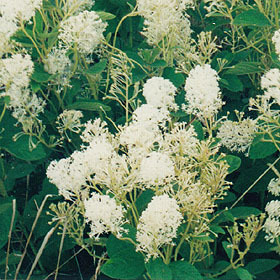 Its short stature makes it a great choice for landscaping applications as well as prairie plantings. 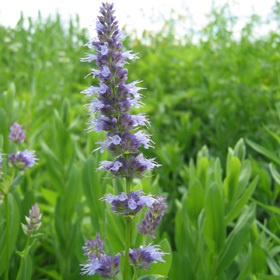 Purple Giant Hyssop (Agastache scrophulariifolia) is a large, purple flowered plant that can tolerate some shade. Pollinators such as bees and butterflies are attracted to its light purple flowers and licorice-scented leaves. Water Plantain (Alisma subcordatum) is an emergent plant that prefers shallow water but will grow long, ribbon shaped-leaves if planted in deeper water. In fall after the flowers have gone to seed, song birds use the hearty stalk as a perch. Northern Water Plantain (Alisma triviale) grows well in shallow, stagnant pools of water and can withstand periods of drought. Its tiny flowers are often visited by small beetles and bees. Wild Garlic (Allium canadense) has a strong onion scent which discourages deer and other small animals from eating it. Its pink flowers attract bees, butterflies and hummingbirds. Edible bulbs fall and take root after flowering. 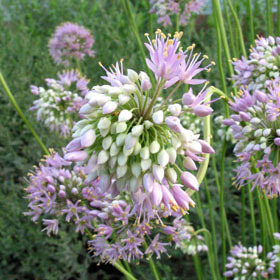 Nodding Onion (Allium cernuum) is an easy-to-grow flower which, like all Allium species, is deer-resistant. It is named for its lavender flowers which droop over the stem. This is an evolutionary adaptation to protect the nectar from rain. 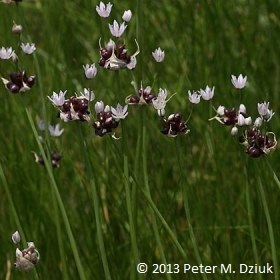 Prairie Onion (Allium stellatum) prefers drier conditions than its cousin, Nodding Onion (Allium cernuum). Prairie Onion’s structure differs slightly from Nodding Onion in that the flowers stand upright rather than droop over the stem. 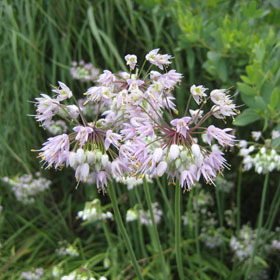 Prairie Onion’s flowers can range in color from pink to purple. 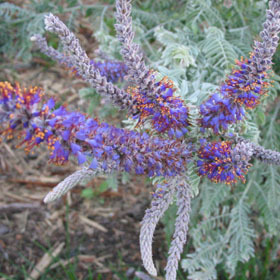 Leadplant (Amorpha canescens) is a deep rooted, shrubby plant which is found on dry, sandy soils throughout the prairie. Shrubs can grow to heights up to 3 feet and tiny spike-like, purple flowers cover the upper portion of each stem. Flowers have a single purple petal which curls around the orange-tipped stamens. 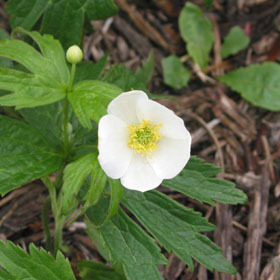 Canada Anemone (Anemone canadensis) is a short, rhizomatous species that makes excellent groundcover in wetter areas. 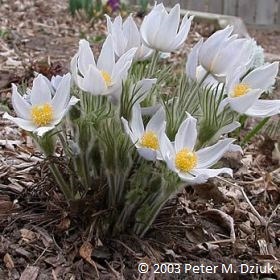 When paired with other shorter species Canada Anemone can be aggressive and inundate these species. 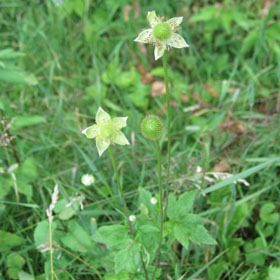 Thimbleweed (Anemone cylindrica) derives its name from the shape of its seed head. After flowering the seed head elongates and resembles a thimble before forming its seed-containing, cotton-like tufts in the fall. 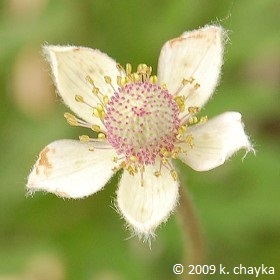 Tall Thimbleweed (Anemone virginiana) is similar in structure to its close relative, Thimbleweed (Anemone cylindrica). 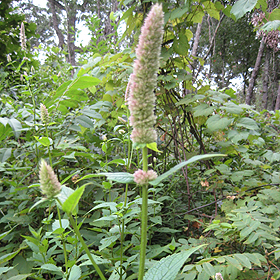 It is a bit taller and the thimble-like seed head is smaller than its relative. 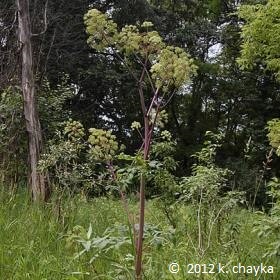 Angelica (Angelica atropurpurea) has a thick, sturdy, purple stem that can grow up to 7 feet tall. It thrives in swampy areas and along stream banks. 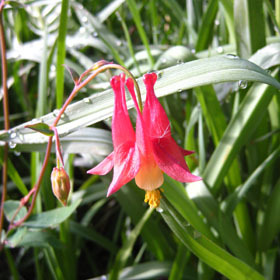 Columbine (Aquilegia canadensis) is one of the first prairie species to flower and provides nectar to many species of butterflies, bees, and hummingbirds in the early spring. Its ability to grow in almost all soil and sun conditions makes it a favorite among gardeners. Jack-in-the-Pulpit (Arisamea triphyllum) is an easy to establish plant found in woodlands throughout the eastern half of the United States. 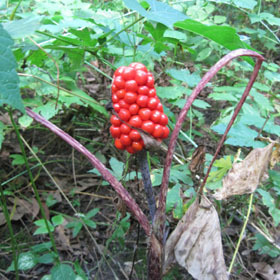 It is deer resistant and is easy to identify by its berries that turn bright red in the fall. 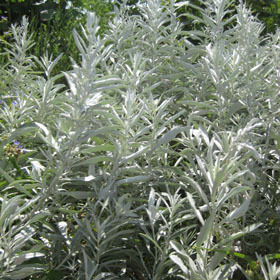 Prairie Sage (Artemisia ludoviciana) has silvery, felt-like leaves. Although aesthetically pleasing, Prairie Sage can become aggressive in landscape applications. Swamp Milkweed (Asclepias incarnata) is a monarch butterfly favorite which thrives in moist conditions. 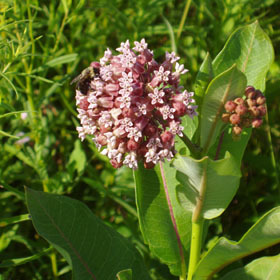 Historically the milkweed family has had many uses. During WWII the sap of milkweeds was used experimentally as a rubber substitute. The silk produced by the seed pods has been used in floatation devices to provide buoyancy. 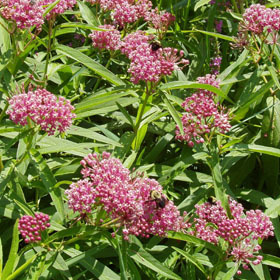 Common Milkweed (Asclepias syriaca) is a beautiful plant with whorled, pink flowers. It is home to many different types of beetles and also monarch butterfly larvae. Landscapers beware, it is rhizomatous and can be aggressive in a variety of soil conditions. Butterfly Milkweed (Asclepias tuberosa) is a beautiful prairie plant that prefers drier, well-drained soils. Its rare orange color makes it a favorite of monarch butterflies. 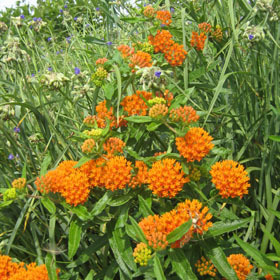 Butterfly Milkweed makes a wonderful addition to any dry prairie or landscape planting. Whorled Milkweed (Asclepias verticillata) is a later-blooming milkweed species. Beautiful white flowers can appear anytime between July and September. It is a great species for pollinators and will have bees, wasps and butterflies visiting its delicate blooms. Sky Blue Aster (Aster azureus) is a vivid and beautiful plant that provides color, as well as nectar for bees and butterflies in the fall. It will grow in a variety of soil types as long as there is adequate drainage. Lindley’s Aster (Aster ciliolatus) is commonly found along roadsides and woodland edges in the northern parts of the US and into Canada. 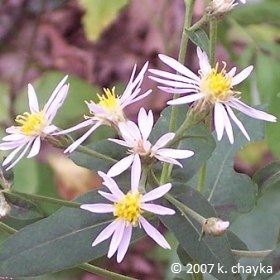 Its toothed leaves and winged leaf stalk distinguish it from other members of the Aster family. 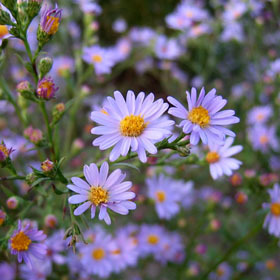 Drummond’s Aster (Aster drummondii) provides late-season color and nectar for small bees, flies and butterflies. 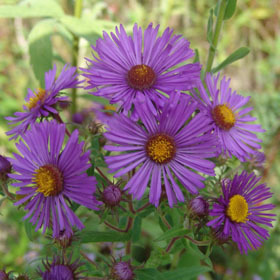 Its broader leaves and sturdy stems help to distinguish it from other Asters. Heath Aster (Aster ericoides) prefers drier conditions than some of the other Asters. 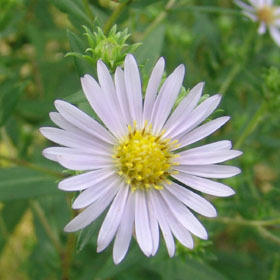 It is most easily distinguished from other Asters by its small flowers which are usually less than 1/2 an inch across. 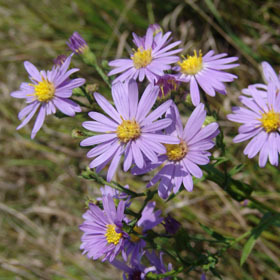 Heath Aster spreads quickly through rhizomes and can become almost bushy in appearance. 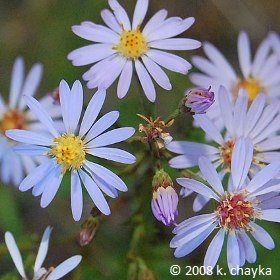 Smooth Blue Aster (Aster laevis) is a late-blooming, nectar providing plant with blooms that are approximately one inch wide. Similar in structure and color to Sky Blue Aster (Aster azureus), Smooth Blue Aster has smooth leaves while those of Sky Blue Asters are rougher in texture. Calico Aster (Aster lateriflorus) is another late-blooming flower that has blooms emerging from lateral stems. 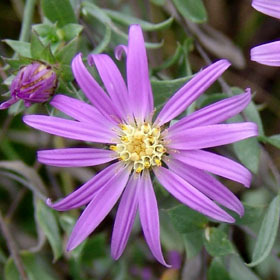 It is also called Side-Flowering Aster and will grow in full sun to full shade. Large-leaved Aster (Aster macrophyllus) is a great plant for a low-light area. It’s an office favorite simply because of its alternate common name, Lumberjack Toilet Paper. This refers to the large, fuzzy, heart-shaped leaves the plant produces. New England Aster (Aster novae-angliae) makes a great addition to any planting or garden in need of some late color. Flowers can vary widely from lavender to pink to purple. It’s a good choice for wet to medium soils. 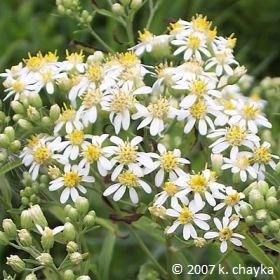 Upland White Aster (Aster ptarmicoides) may look like an aster but has been re-classified as a member of the goldenrod (Solidago) family. It is a short species which prefers dry conditions and is often found growing out of rocky outcroppings. 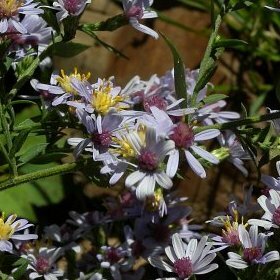 Swamp Aster (Aster puniceus) is similar to New England Aster (Aster novae-angliae) but prefers wet, alkaline soils. Another common name, Red-stemmed Aster, refers to the color of the stem on mature plants. This late bloomer makes a fantastic addition to wetland plantings. 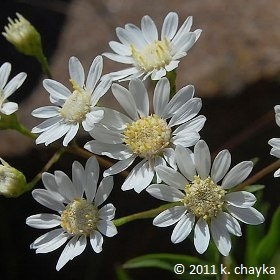 Arrow-leaved Aster (Aster sagittifolius) tolerates almost any amount of sunlight and prefers mesic to dry soils. Its large, prolific blossoms often cause the plant to bend when flowering. Silky Aster (Aster sericeus) is a beautiful, shorter plant for dry sites. The leaves take on a silver-green color and feel smooth due to the fine hairs that cover them. 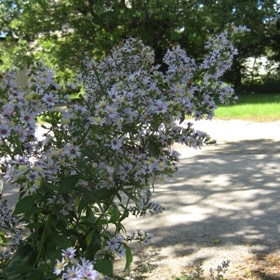 Panicled Aster (Aster simplex) is a hearty plant that almost prefers poor soil conditions. It tends to form dense colonies through its spreading rhizomes. These thick colonies are important sources of nectar in the fall for bees, wasps, moths and butterflies. Flat-topped Aster (Aster umbellatus) is an important food source for larvae of many butterflies and moths. It needs room to grow and may tip over when in bloom. 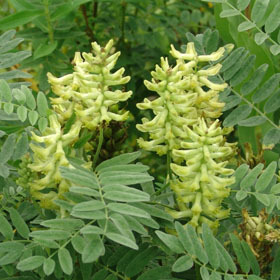 Canada Milk Vetch (Astragalus candensis) is an important nitrogen-fixing legume. It provides nectar to bees and food for weevils, rabbits, deer and wild turkey. 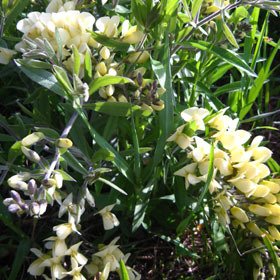 White Wild Indigo (Baptisia alba) is a striking prairie plant that produces beautiful white flower spikes in summer and attractive black seed pods in fall. 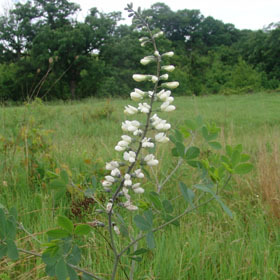 Resembling asparagus when it first emerges from the soil, White Wild Indigo shouldn’t be eaten because of its toxicity. 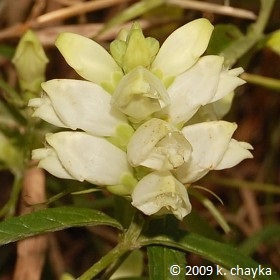 Cream Wild Indigo (Batisia leucophaea) is a shorter, earlier bloomer than its cousin, White Wild Indigo (Baptisia alba). 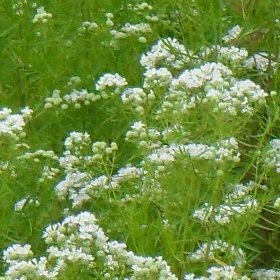 It grows low to the ground and produces long, bending, creamy blossoms in the spring and bluish-black seed pods after flowering. Nodding Bur Marigold (Bidens cernua) has beautiful yellow flowers that emerge in the summer months. Flower heads tend to droop or "nod" with age. Nodding Bur Marigold seeds are often called sticktights due to the tendency of the barbs on each seed to stick to whatever comes in contact with it. 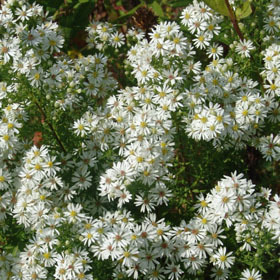 False Aster (Boltonia asteroides) produces many white blossoms in the late summer and fall. Its rhizomes are easily divided in the spring. False Aster makes a great background species for a perennial wildflower garden. 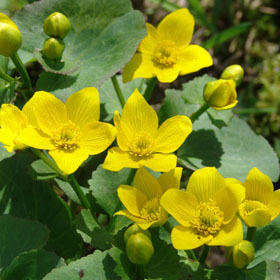 Marsh Marigold (Caltha palustris) produces lovely, yellow flowers and large heart-shaped leaves that have serrated edges. It is a delightful sight to see in the spring after winter’s drab colors. 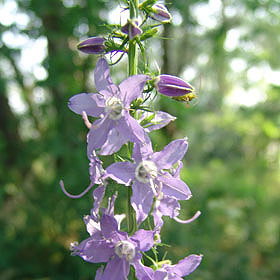 Tall Bellflower (Campanula americana) is a biennial plant that is often confused with Great Blue Lobelia (Lobelia siphilitica) due to similar structures. Its blue to violet flowers are a giveaway to its identity once in bloom since it looks like no other native flower. Technically a shrub, New Jersey Tea (Ceanothus americanus) was used during the Revolutionary War as a substitute for tea even though it contains no caffeine. Its deep, red taproot can fix nitrogen which benefits the soil and other plants around it. 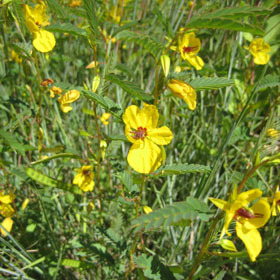 Even though it is an annual, Partridge Pea (Chamaecrista fasciculata) often reseeds itself. Its leaves fold when they are touched and seed pods easily break open when seed is ripe. 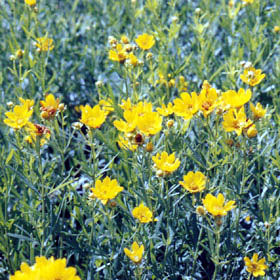 Sand Coreopsis (Coreopsis lanceolata) is easily cultivated and grown in wildflower gardens. Its showy flowers and nectar are an attractant to many butterflies, moths and bees. It is popular among beekeepers as a good source of honey. 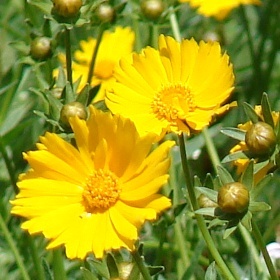 Prairie Coreopsis (Coreopsis palmata) is a hearty plant that will grow in virtually any soil type. It has a tendency to spread out if not planted in full sun. Like other members of the Coreopsis family, beekeepers value it as a good honey source. 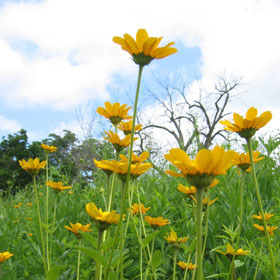 Tall Coreopsis (Coreopsis tripteris) is the tallest and latest blooming member of the Coreopsis family. When grown in large groups, its tall stems sway individually in the breeze creating a mesmerizing effect. 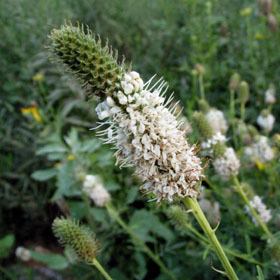 White Prairie Clover (Dalea candidum) is a staple of the prairie. Its white blooms are slightly less common than Purple Prairie Clover (Dalea purpurea) but they are often found growing together. 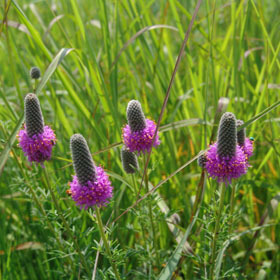 Purple Prairie Clover (Dalea purpurea) is often found growing with White Prairie Clover (Dalea candidum). Before flowering, these plants can be difficult to identify. One easy way to tell them apart is leaf size. 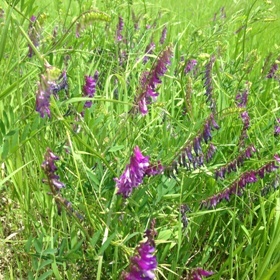 Purple Prairie Clover has narrower leaves than White Prairie Clover. 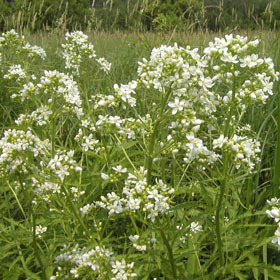 Illinois Bundle Flower (Desmanthus Illioensis) is a high-protein plant which makes it a favorite among grazing animals. It is often grown for its fern-like foliage and interesting seed head. Showy Tick Trefoil (Desmodium canadense) is a beautiful nitrogen-fixing legume which may be more aesthetically pleasing when growing in clusters rather than individual plants. 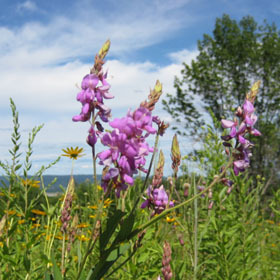 A member of the bean family, Showy Tick Trefoil is a favorite food for deer, livestock, groundhogs and rabbits. Its seeds are a good food source for wild turkey and other game birds. Illinois Tick Trefoil (Desmodium illinoense) has similar flowers and structure to Showy Tick Trefoil (Desmodium canadense) but is slightly less ornate. It is a nitrogen-fixing legume which produces seed pods with stickers on them. eer, rabbits, livestock and other animals consume the foliage and help distribute the seed pods, which cling to fur. 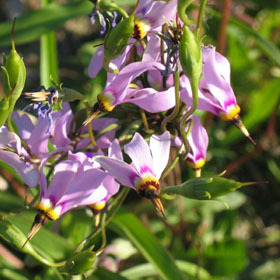 Midland Shooting Star (Dodecatheon meadia) is a wonderful early-blooming flower. Its blossoms can vary from shades of purple and pink to white. Since it blooms so early in the spring, the plant is completely dormant by mid-summer. Narrow-leaved Coneflower (Echinacea angustifolia) is the only Echinacea native to Minnesota though Pale Purple (E. pallida) and Purple (E. purpurea) will readily grow here. A smaller Echinacea, Narrow-leaved Coneflower prefers full sun and blooms during the summer months. 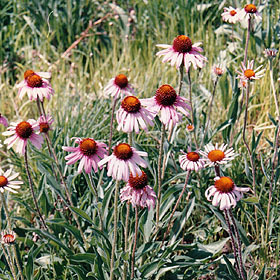 Pale Purple Coneflower (Echinacea pallida) can be easily mistaken for its close relation, Purple Coneflower (Echinacea purpurea). 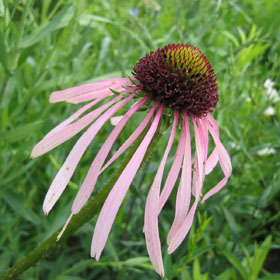 Pale Purple Coneflower blooms slightly earlier than Purple Coneflower and has narrower leaves and blossoms that are slightly lighter in color. Purple Coneflower (Echinacea purpurea) is a classic flower that many people picture when thinking about a prairie. 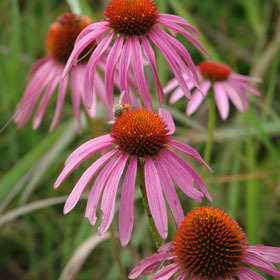 Historically Purple Coneflower has been used medicinally for everything from snakebites to sore throats. It is still used widely today in the herbal medicine community. 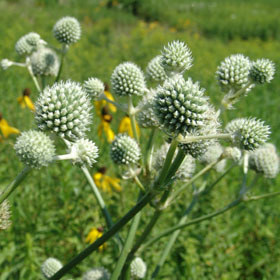 Rattlesnake Master (Eryngium yuccifolium) is named for its leaves, which are similar to those of the Yucca plant. It thrives in wet mesic to dry mesic sites in full sun. Its bristly flowers add a unique texture to any planting. Joe Pye Weed (Eupatorium maculatum) has a beautiful array of rose-colored flowers on top of a tall stem which, under ideal conditions, can grow up to six feet. Sometimes called Spotted Joe Pye Weed, it prefers rich, wet to wet mesic soils and partial to full sun. 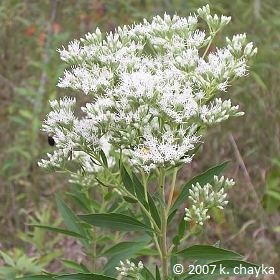 Boneset (Eupatorium perfoliatum) is not the showiest species, but is interesting due to its foliage. Each of the leaves are fused together at the base, making the stem appear as if it is cutting through the leaves. This characteristic gave this species its common name since people once thought it could heal fractured bones. 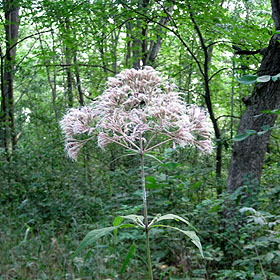 Sweet Joe Pye Weed (Eupatorium purpureum) is a taller, more upland version of Joe Pye Weed (E. maculatum). 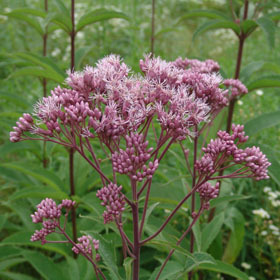 Preferring shady to partially shady areas, Sweet Joe Pye Weed has pink, fragrant blossoms. These flowers (along with the leaves) give off a lovely vanilla scent when crushed. Flowering Spurge (Euphorbia corollata) is a delicate-looking flower with unbranched, straight stems that resemble Baby’s Breath. This plant will reproduce and spread through rhizomes. 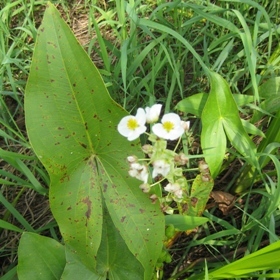 The milky sap produced by this plant can be irritating to those with sensitive skin. Bottle Gentian (Gentiana andrewsii) has stunning, blue flowers which never open. Bumblebees are the only insect strong enough to pry open the flower heads. It blooms in the fall and provides wonderful, late season color to any garden. 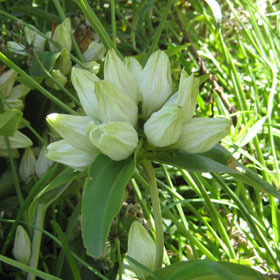 Cream Gentian (Gentiana flavida) is a late summer bloomer which has cream-colored flowers that occur in clusters at the top of the plant. It prefers average soils and full to partial sun. 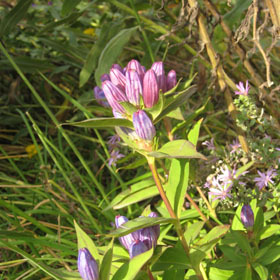 Cream Gentian makes a beautiful companion plant to the more typical yellows and purples of the prairie. 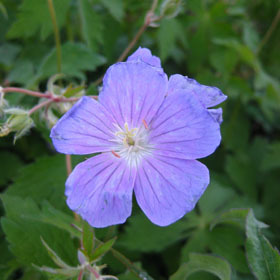 Wild Geranium (Geranium maculatum) will tolerate any amount of sunlight, though it prefers partial sun. 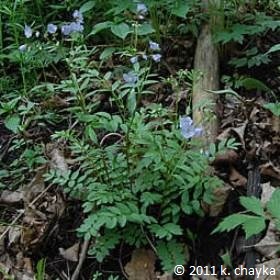 It is commonly found growing on the forest floor. Wild Geranium has an interesting way of hurling the seed from the mother plant when mature, which makes seed collection difficult. 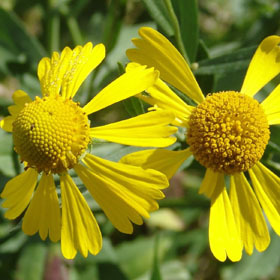 Sneezeweed (Helenium autumnale) is a wetland species which has small, yellow flowers that bloom in the late summer and fall. Contrary to its name, the pollen from Sneezeweed is not what makes one sneeze, but rather the seed. Giant Sunflower (Helianthus giganteus) is a very tall plant, in some cases reaching a height of ten feet. Stems of Giant Sunflower may be purple in color. At the top of its hairy, rough stems sits a 2-3 inch yellow flower which blooms from July to September. Sawtooth Sunflower (Helianthus grosseserratus) is named for its slightly serrated leaves which resemble sawteeth. It is differentiated from other sunflower species by its red stems. 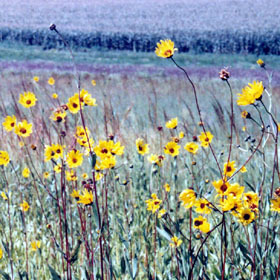 The height of Sawtooth Sunflower varies from four to eight feet depending on colony size, soil type and other factors. 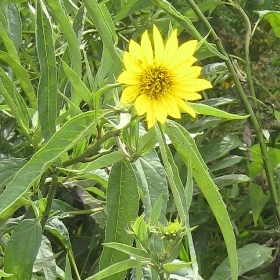 Showy Sunflower (Helianthus laetiflorus) prefers drier soils than most other sunflowers. 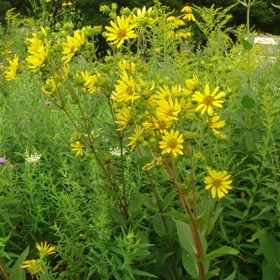 Its yellow blooms appear in July and last until early fall. As is the case with most sunflowers, it is rhizomatous and may not be suited to small landscaping applications. Maximillian’s Sunflower (Helianthus maximiliani) varies in height from three to eight feet. It is differentiated from other sunflowers by its downward-curving, trench-shaped leaves which can be three to seven inches long. Maximillian’s Sunflower is aggressive and reproduces through rhizomes. 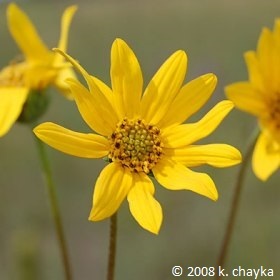 Western Sunflower (Helianthus occidentalis) is a smaller, more delicate-looking sunflower. It does produce rhizomes, but spreads slower than many other Helianthus species making it a better choice for landscapers. 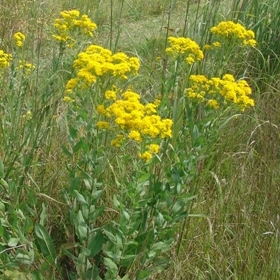 It prefers drier soils and produces small, yellow flowers in the summer and early fall. 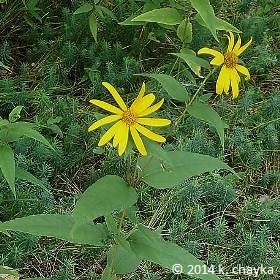 Pale Leaf Woodland Sunflower (Helianthus strumosus) is better adapted to wooded and shadier areas than most other Helianthus species. However, it is aggressive and rhizomatous. 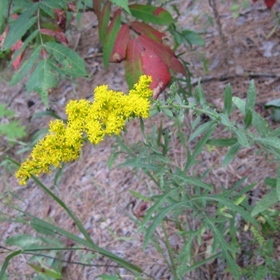 Yellow blooms appear in summer and last into October. Ox-eye Sunflower (Heliopsis helianthoides) is a short-lived, long-blooming perennial plant which prefers full to partial sun. Growing up to five feet, its stem may be branched at the top with many flowers, or unbranched with just one. It is easily grown and cultivated from seed, but can be aggressive in landscape situations. 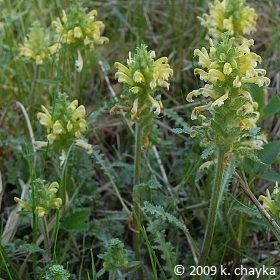 Prairie Alumroot (Herchera richardsonii) is a shorter plant which prefers rocky, drier soils but will grow on sites with clay or loamy soils. It has large basal leaves that are similar in appearance to maple leaves. A close relative, Coralbells, is popular with gardeners and landscapers. 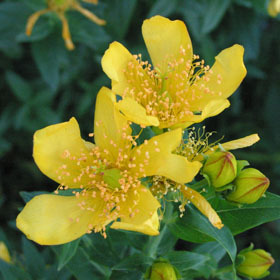 Great St. John’s Wort (Hypericum pyramidiatum) produces yellow flowers which sit at the top of a four- to six-foot stem. It prefers wet mesic to mesic soils and blooms during the summer months. Northern Blue Flag Iris (Iris versicolor) has beautiful deep blue to violet flowers that bloom in the late spring and early summer. 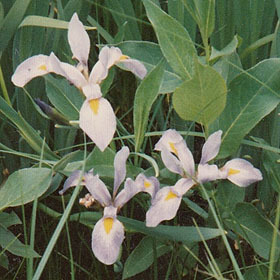 Often spreading through rhizomes, Northern Blue Flag Iris can form large colonies on wetter sites. Southern Blue Flag Iris (Iris virginica shrevei) is very similar to Northern Blue Flag Iris (Iris versicolor). 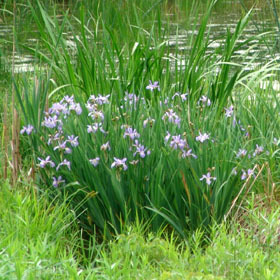 Southern Blue Flag Iris’s flowers are lighter in color and have a larger yellow spot on them. Both species have long, sword-shaped leaves and reproduce vegetatively. 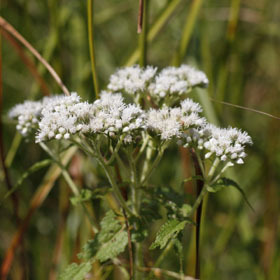 False Boneset (Kuhnia eupatorioides) is sometimes confused with Boneset (Eupatorium perfoliatum). They differ in their leaf arrangement. 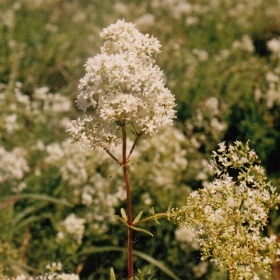 Kuhnia has alternate leaf arrangement, while Eupatorium has opposite leaves. 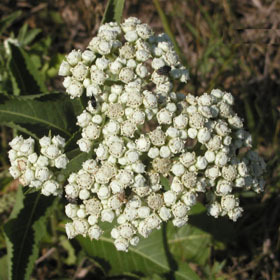 False Boneset prefers drier soils and full sun exposure. Round-headed Bush Clover (Lespedeza capitata) is a perennial legume which grows in mesic to dry soils. Its high protein content makes it a favorite plant of grazers. Bush Clover seeds are eaten by many small gamebirds and songbirds. Button Blazingstar (Liatris aspera) has beautiful, rounded flowers which bloom from the top downward in late summer and early fall. It prefers dry soils and full sun, but it will tolerate a small amount of shade. 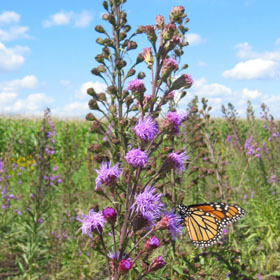 Liatris species are an important source of nectar for many butterflies and bees. Dwarf Blazingstar (Liatris cylindracea) is the shortest of the Blazingstars. Reaching a height of 1 foot to 18 inches, its beautiful blossoms last into October. It has a preference for full sun and poor-quality, dry soils. 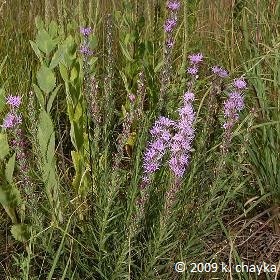 Meadow Blazingstar (Liatris ligulistylis) is one of the taller Blazingstars. It is similar in structure to Button Blazingstar (L. aspera) but has longer racemes. It is a favorite of the monarch butterfly and other pollinators. Dotted Blazingstar (Liatris punctata) is a shorter Blazingstar which prefers dry soils. Because of this preference, it has a high tolerance to drought. 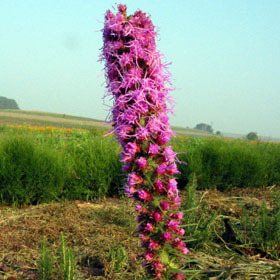 It is most easily distinguished from other Liatris species by its long, leaf-like bracts between flowers. Prairie Blazingstar (Liatris pycnostachya) provides beautiful color in the summer and into fall. Hummingbirds, butterflies and bees are all attracted its blossoms. Prairie Blazingstar makes a great border plant for wildflower gardens. Marsh Blazingstar (Liatris spicata) is more tolerant of moist conditions than other Blazingstars but will grow in mesic conditions as well. Similar to Prairie Blazingstar (L. pycnostachya) it blooms from the top down during the summer months. It is also called Dense Blazingstar due to the thickness of its blooms. 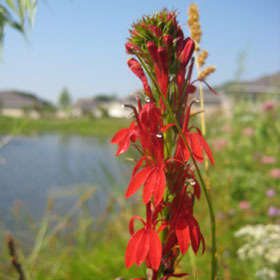 Cardinal Flower (Lobelia cardinalis) is one of the few red wildflowers. Its goregeous blooms open from the bottoom up in July and last into the fall. Hummingbirds and several species of swallowtail butterflies are attracted to Cardinal Flower’s deep red color. 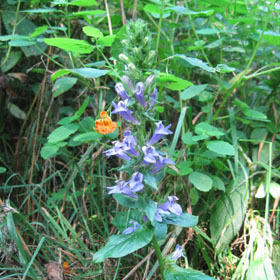 Great Blue Lobelia (Lobelia siphilitica) produces beautiful blue flowers in the late summer and early fall, providing some much-needed color when the landscape is dominated by yellow flowers. This plant has a preference for moist soils, but will grow in mesic conditions as well. Bees are its main pollinator. Seedbox (Ludwigia alternifolia) is named for the fruit of the plant which looks like an almost square box with a hole in the top. This little box contains the seed. Yellow flowers are in bloom during the summer months. 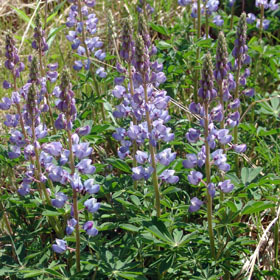 Wild Lupine (Lupinus perennis) produces lovely blue flowers and is one of the first species to emerge after a controlled burn. Its compound leaves provide interesting foliage before and after flowering. The Karner Blue Butterfly depends on Wild Lupine to provide a food source for its young. 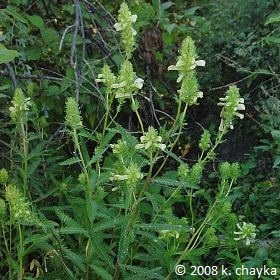 Water Horehound (Lycopus americanus) is a member of the mint family. 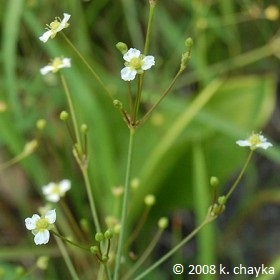 It has a square stem and can be differentiated from other Lycopus species by its deeply lobed bottom leaves. 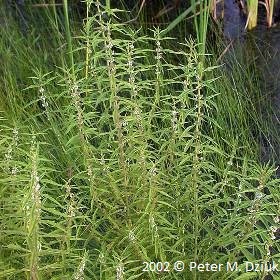 Water Horehound is most commonly found in swampy, wet areas growing in full sun. Monkey Flower (Mimulus ringens) is named for the shape of its flower. If you squeeze the flower together and blur your vision, the bloom looks like a monkey’s face. 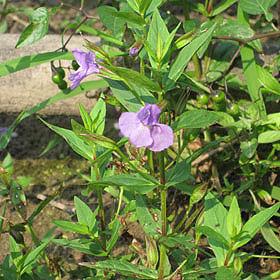 Monkey flower grows in wet areas and prefers full sun. Wild Bergamot (Monarda fistulosa) has the typical square stem of the mint family. Though easy to grow, Wild Bergamot has a tendency to get powdery mildew on its leaves during wet weather and the plant itself can become dingy-looking as the season progresses. 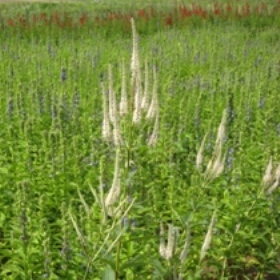 Despite these issues, Wild Bergamot produces beautiful lavender flowers from July through September. 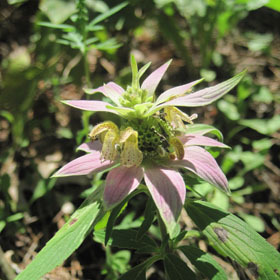 Spotted Bee Balm (Monarda punctata) has unusual-looking flowers that bloom in late summer. 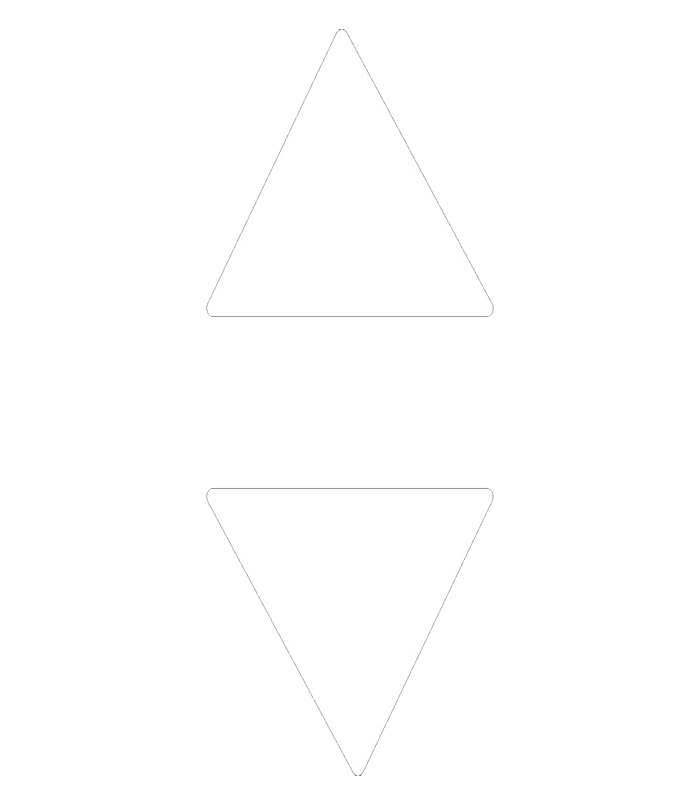 Color can range from white to pink to lavender. 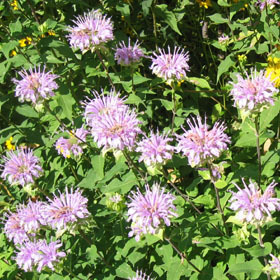 Spotted Bee Balm prefers full sun and well-drained, sandy soils. Glade Mallow (Napaea dioica) is a tall, ancient species with white blooms that appear in the summer. It grows along riverbanks and alluvial plains in full to partial sunlight. 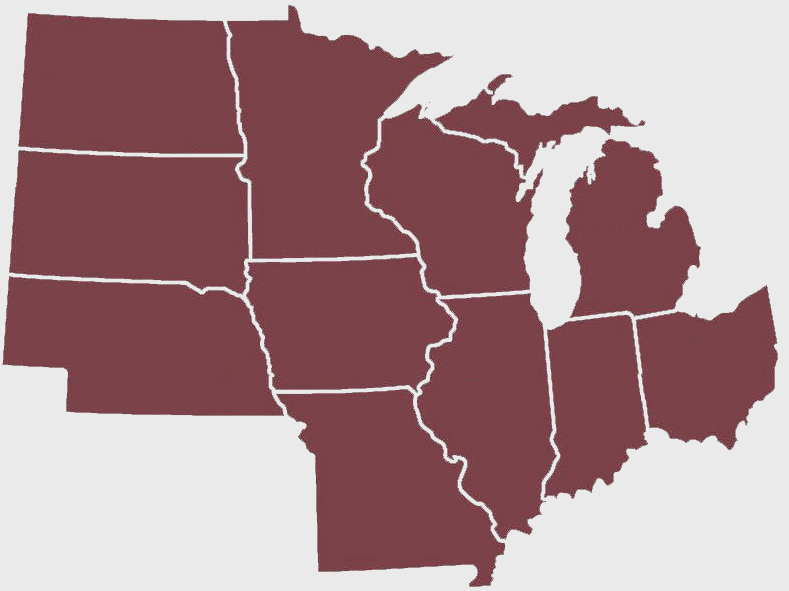 It is currently listed as a threatened species in Minnesota due to its only known populations occuring in a few counties in the southeast portion of the state. 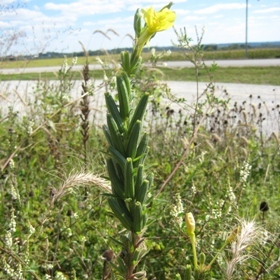 Common Evening Primrose (Oenothera biennis) is a biennial plant which readily reseeds itself after completing its life cycle. Seeds have been said to remain dormant in the soil for up to seventy years. 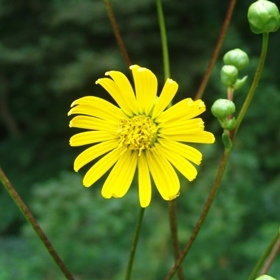 Yellow flowers appear in the second growing season from June to September. 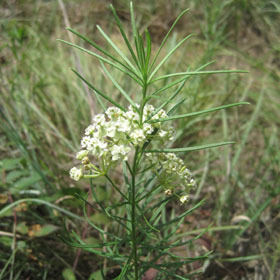 Wild Quinine (Parthenium integrifolium) has large, toothed leaves and small, white, cauliflower-like flowers. It prefers mesic soils and full sun. 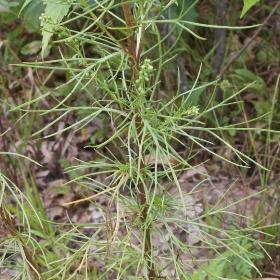 This plant was used during World War I as a substitute for Cinchona bark in the treatment of malaria. 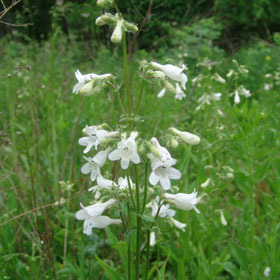 Foxglove Beardtongue (Penstemon digitalis) produces white flowers in the early summer and will grow in almost any amount of sun. 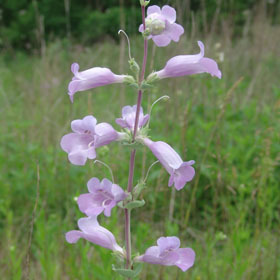 Preferring mesic to slightly dry soils, Foxglove Beardtongue grows up to four feet tall. The seed heads and seed produce a distinctive, strong odor. Large-flowered Beardtongue (Penstemon grandiflorus) has large, bluish-gray leaves and lavender flowers. It is easily distinguished from other Penstemon species by these characteristics. It grows best in drier soils in full sun, but will tolerate partial shade. It is short-lived but will reseed itself. Ditch Stonecrop (Penthorum sedoides) is a wetland species that is not very drought tolerant. Its green, yellow-green or greenish-white blossoms take on a red appearance at maturity. Ditch Stonecrop produces seed and also spreads vegetatively through rhizomes. 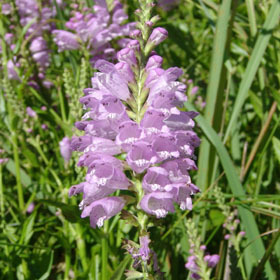 Obedient Plant (Physostegia virginiana) is named for the tendency of each flower to stay in position when moved. This common name certainly doesn’t apply to the plant as a whole as it is rhizomatous and aggressive. Though beautiful, it is probably not suited for small landscaping situations. 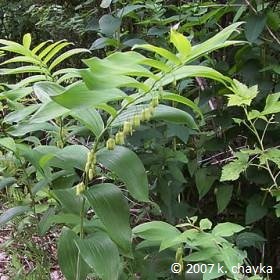 Solomon’s Seal (Polygonatum canaliculatum) doesn’t have a particularly showy flower, but has beautiful foliage. 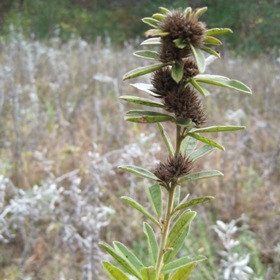 Each arching stem has several leaves which are up to six inches long. Fruit is contained in berries which form in the early summer. Prairie Cinquefoil (Potentilla arguta) has flowers that resemble those of the strawberry. 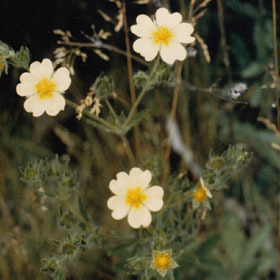 Prairie Cinquefoil prefers dry, well-drained soils and full sun. When UV light is passed through a filter and shined upon Prairie Cinquefoil, a pattern emerges on the flower which serves to guide pollinating insects to the bloom. Mountain Mint (Pycnanthemum virginianum) has slender leaves and the typical square stem of the mint family. It prefers wet to medium wet soils. 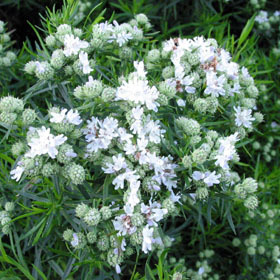 The leaves of Mountain Mint produce a strong, minty scent when crushed or damaged. Long-headed Coneflower (Ratibida columnifera) is sometimes called Mexican Hat. 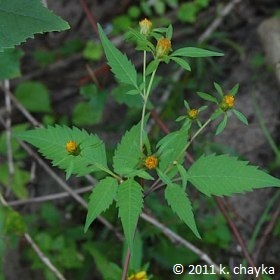 Its yellow flowers may have traces of maroon in the leaves. 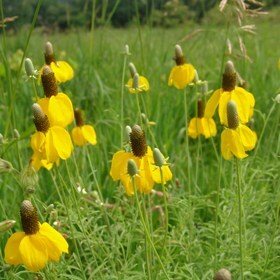 It can be differentiated from Yellow Coneflower (Ratibida pinnata) from its enlongated seed head and shorter stature. Yellow Coneflower (Ratibida pinnata) is a hardy species which can be found in abundance in most remnant prairies. It prefers medium to slightly dry soils and full to partial sunlight. 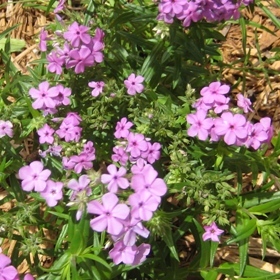 It is easy to grow from seed and makes a great starter plant for those who are attempting to plant a wildflower garden. Prairie Wild Rose (Rosa arkansana) is a shrubby, shorter prairie species which produces pink flowers in the summer. It has a very high drought tolerance. This species is rhizomatous and aggressive and may not be suitable for landscaping applications. 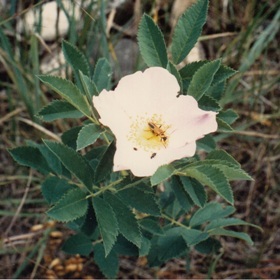 Early Wild Rose (Rosa blanda) is very similar to Prairie Wild Rose (Rosa arkansana), differing in their height and bloom time. 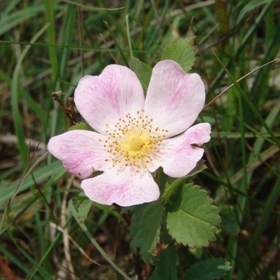 Early Wild Rose blooms for a shorter period of time than Prairie Wild Rose. Both species are rhizomatous and aggressive. Black-eyed Susan (Rudbeckia hirta) is a biennial plant which will readily reseed itself after completing its life cycle. 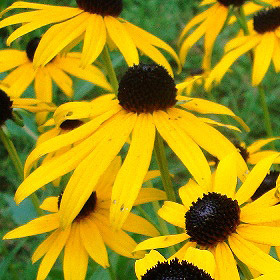 A favorite of wildflower gardeners, Black-eyed Susan is easy to grow from seed and sometimes blooms in its first growing season. 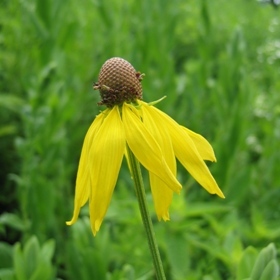 Wild Golden Glow (Rudbeckia laciniata) has yellow flowers with with green cones which resemble a pincushion. Growing up to twelve feet tall, Wild Golden Glow is one of the tallest Rudbeckia species. This plant does spread through rhizomes and may be difficult to keep under control. Sweet Black-eyed Susan (Rudbeckia subtomentosa) is similar in structure to Black-eyed Susan (Rudbeckia hirta) only it has fewer ray florets (petals) and is taller. 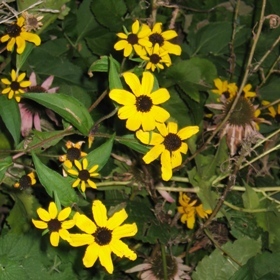 Sweet Black-eyed Susan is a perennial which flowers during late summer and into fall. The leaves of Sweet Black-eyed Susan have a lovely, sweet fragrance when crushed. Brown-eyed Susan (Rudbeckia triloba) is a bushy plant which may reach up to five feet tall. 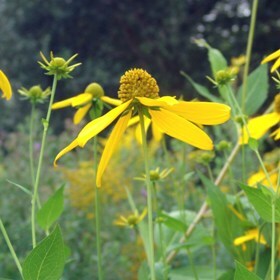 This species is easy to tell apart from the other Rudbeckias due to its smaller number of ray florets and brown cones. 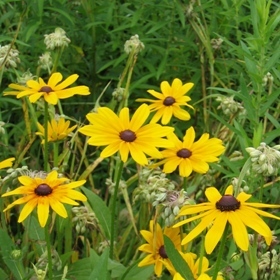 Brown-eyed Susan is a short-lived perennial but easily reseeds itself. Common Arrowhead (Sagittaria latifolia) is a common wetland plant often found growing in shallow ponds, lakes and rivers. 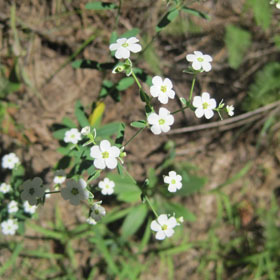 Small, white flowers emerge from the plant in late fall. Arrowhead is an important food source for waterfowl and muskrats. Early Figwort (Scrophularia lanceolata) is a nectar-rich flower that pollinators love. This perennial grows to 6′ high on a smooth, un-branched stem. The tubular shaped flowers are shiny reddish brown on the outside. 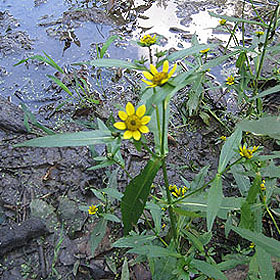 Rosin Weed (Silphium integrifolium) is the shortest and perhaps the most drought-tolerant member of the Silphium family. Its leaves are opposite and have a sandpapery texture to them. Like the other Silphiums, it produces a resinous gum when in bloom. 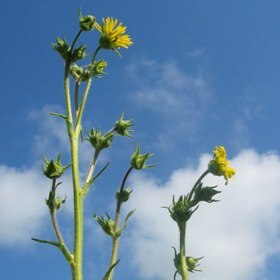 Compass Plant (Silphium laciniatum) is a very tall plant with large, lobed basal leaves. These leaves orient themselves in a north-south direction giving the plant its common name. 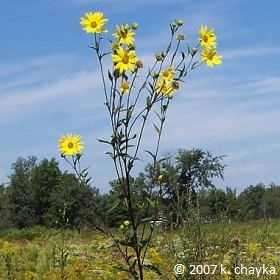 Great for tall grass prairies, Compass Plant’s roots may travel 20 feet into the ground. 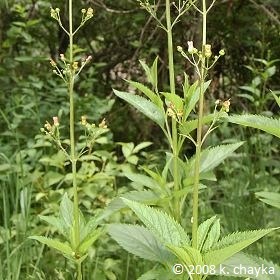 Cup Plant (Silphium perfoliatum) is a distinctive plant named for the coarsely toothed, opposing leaves that form a cup around the plant’s square stem. The cups catch and retain rainwater that is used by birds and insects. Birds, especially goldfinches, are very fond of the seeds, and bees and butterflies visit regularly to pollinate the flowers. 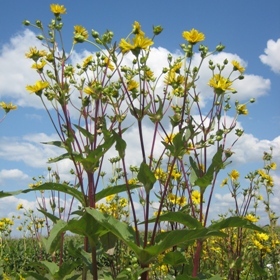 Prairie Dock (Silphium terebinthinaceum) is undeniably the giant of the prairie, reaching heights of up to 9 feet tall. Its paddle-like leaves can be 20 inches long and 10 inches wide and often orient themselves along a north-south axis for maximum leaf exposure to the sun. The taproot of this drought resistant monster can travel down 20 feet or more in search of water! 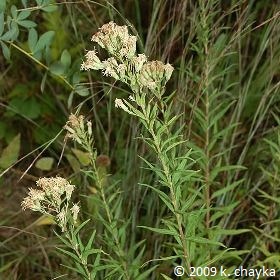 Grass-leaved Goldenrod (Solidago graminifolia) is an aggressive species that is named for its thin, long, grass-like leaves. This widespread, flat-topped plant is the Goldenrod that most people are familiar with. Gray Goldenrod (Solidago nemoralis) is one of the shortest Goldenrods, making it an ideal choice for drier landscaping applications. Its yellow blooms emerge in the fall, providing vibrant color late in the growing season. Ohio Goldenrod (Solidago ohioensis) is distinguishable by its short and wide shape, lush green leaves, and flat-topped clusters of yellow flowers. It prefers moist, sunny sites, but is tolerant of most soil types. 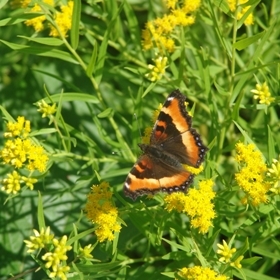 Riddell’s Goldenrod (Solidago riddellii) is a stout, showy, late season bloomer. All sides of the branches are covered with yellow flowers that grow in a short, thick, domed cluster at the top of the stem. Stiff Goldenrod (Solidago rigida) is frequently found in well-drained prairies throughout the tallgrass region. 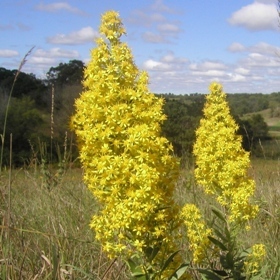 Its flower heads, which grow in rounded or flattened clusters at the top of each plant, are bigger than those of most of the other Goldenrods. 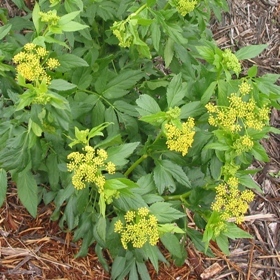 With its large basal leaves, the plant resembles an Aster more than the other Goldenrod species. Showy Goldenrod (Solidago speciosa) is one of the last plants to bloom in the mesic to dry prairie. 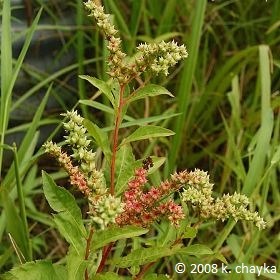 Its red, candle-like stems are covered with soft, yellow flowers that stay erect or curve upward unlike the other Goldenrod species. 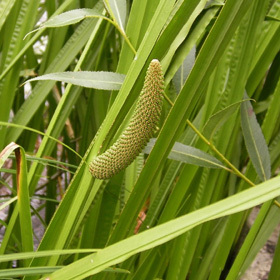 Giant Bur Reed (Sparganium eurycarpum) is commonly found in marshes and along the edges of streams, ponds, and lakes in water up to 3 feet deep. The ribbon-like leaves can grow both above and below the water line. 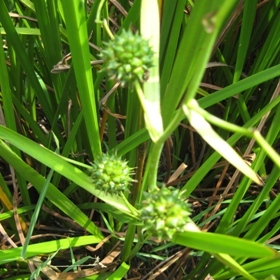 Once mature, the round cluster of seeds takes on a prickly, mace-like appearance. Purple Meadow Rue (Thalictrum dasycarpum) is named for its distinctly purple stems. In the late spring, these distinctive plants are crowned by clumps of soft, almost feathery flowers. 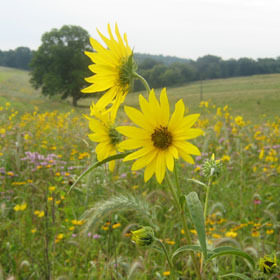 At heights of up to 6 feet tall, they add beauty to any wet prairie, meadow, or streambank where they are found. 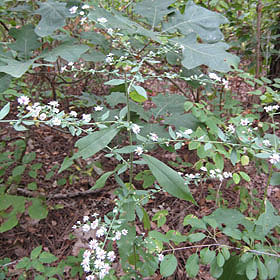 Early Meadow Rue (Thalictrum dioicum) is a great plant to use in shady sites with rich soils. Its bushy shape is as broad as it as tall and the fern-like foliage will last the entire growing season. 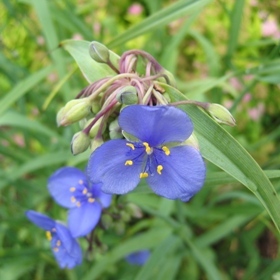 Prairie Spiderwort (Tradescantia bracteata) can most easily be distinguished from the other Spiderworts by its short stature and the presence of glandular hair on its foliage. The 3-petaled flowers pop out one or two at a time and open fully during the day, then wither and curl under to be replaced by new blooms the following day. It can spread easily in dry sunny sites by seed or through underground rhizomes. 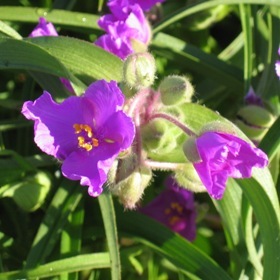 Ohio Spiderwort (Tradescantia ohiensis) is the most widespread of all of the Spiderworts. The 3-petaled flowers pop out one or two at a time and open fully during the day, then wither and curl under to be replaced by new blooms the following day. The unusual foliage makes it a very striking addition to any planting. 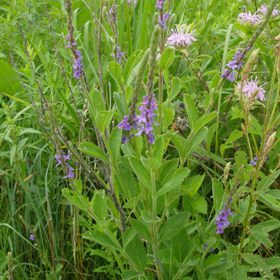 Blue Vervain (Verbena hastata) is widely found throughout open wet areas such as wet prairies, low pastures, marshes, and stream banks. It erects numerous spikes of small, blue to purple flowers that give it a candelabra-like appearance. 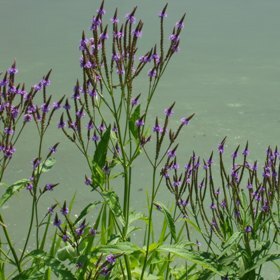 Hoary Vervain (Verbena stricta) is a common component of many dry prairie seed mixtures since it germinates quickly and produces seed readily. 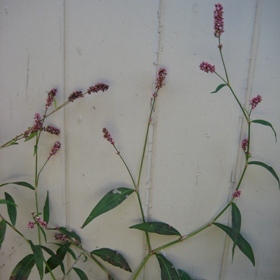 Distinctive spikes of flowers and hairy leaves and stems make it easy to identify. 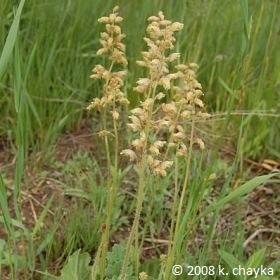 This plant is avoided by livestock due to its bitter taste and can become abundant in overgrazed areas. 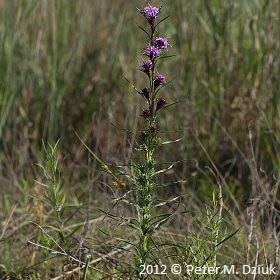 Common Ironweed (Vernonia fasciculata) is frequently found in wet prairies and moist prairie depressions. It is a tall, majestic plant with flowers that are an unusually brilliant shade of purple. This makes it a favorite species for tallgrass plantings. Since it is unpalatable to animals, it is sometimes left standing alone in grazed areas. Culver’s Root (Veronicastrum virginicum) is a stunning and unique plant that will provide visual interest to any planting. By midsummer, plants send out tall, slender spikes at the tops of the branches. 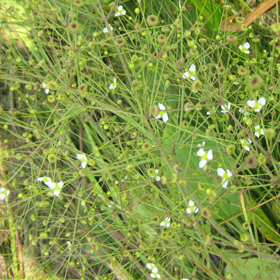 Each spike is densely covered by clusters of small, white flowers. American Vetch (Vicia americana) is found sporadically in prairies and open woodlands through most of the northern and western tallgrass region. It prefers moist growing conditions, and produces small seed pods ranging from 1 to 1.5 inches long that forcefully pop open when the seed is ripe. Heartleaf Alexanders (Zizia aptera) is a close relative of Golden Alexanders (Zizia aurea), but can tolerate considerably drier conditions. Its dark green, spade shaped, basal leaves make it a great choice for landscaping applications. Various kinds of small bees and flies regularly visit the flowers for nectar. Golden Alexanders (Zizia aurea) is found in abundance in moist prairies and stream banks throughout the tallgrass region. The attractive, small yellow flowers are an important source of nectar for a number of insects, and the leaves serve as a larval food plant for the beautiful Black Swallowtail butterfly.